B]Exceptionally sweet honey an aromatic expression of the untainted island of Sardinia. It is a clean, natural expression of the character of the island, where large swathes of untainted floral wilderness enable the production of high-quality honey. SIRISSI honey is very special, and stands out due to its white colour, its creaminess and its sweet taste. SIRISSI honey is a product that contains no colourants or preservatives. Just open the jar and you are sure to be enchanted by its fresh aroma and delicately taste. 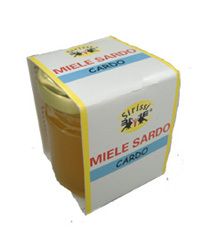 SIRISSI honey is a typical Sardinian productthat comes in crystallised form because it is processed at low temperatures, thus conserving all of its original natural properties. It is worth taking the time to get used to crystallised honey: it may be less convenient than liquid honey, but it is actually much easier to manage, as it does not drip. Moreover, it tastes less sweet and more fresh on the palate. Crystallised honey can be liquified by heating it in a bain-marie at a temperature of below 40°C. It can then be poured into the still-warm dish or beverage. This product can be stored for at least 12 months.